Delegate365 version 6.6 brings some improvements on the basis of version 6.5. New sync rules: The menu administration / sync / "sync options" has been renamed to "sync rules" in Version 6.5. 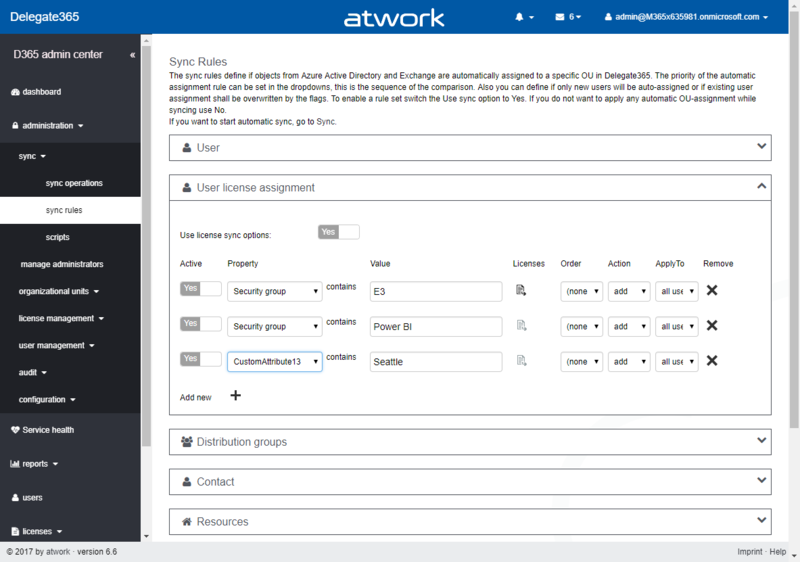 Now, the "user license assignments" have been extended with additional options as in the screenshot below. A sync rule can now be switched on or off with the "Active" switch to simplify testing ("On" is the default setting for existing rules). The new "order" allows to reorder the rules. "Action" now allows not only to add Office 365 licenses, but also to remove the selected licenses, which was a often requested feature. "Apply to" allows to execute the rule against "all users", "sign-in allowed" or "sign-in blocked" users. The new options deliver a much more granular control of license settings. The active sync rules are considered at each sync operation in Delegate365. Don’t forget to save any changes at the page bottom "Save" button! 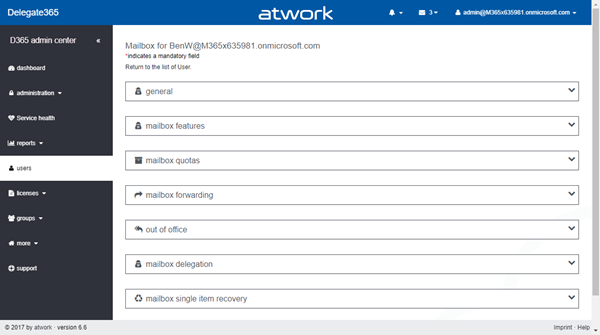 Remember, the more rules are enabled, the longer the sync operation will run, in large Office 365 tenants this might take hours, since every object must be checked and the operations will be executed. 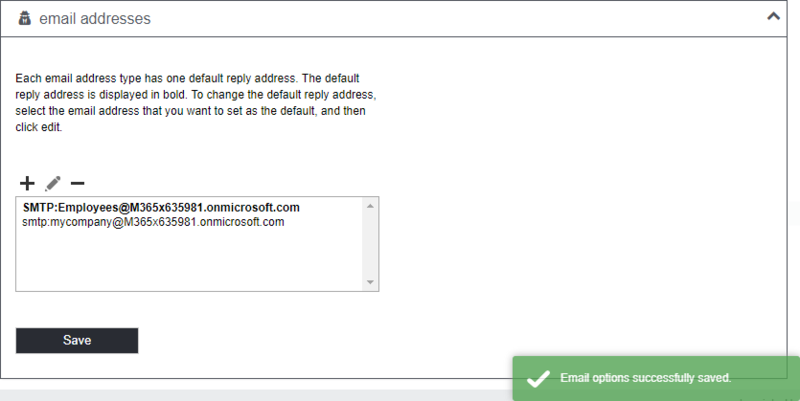 New Mailbox features: In the users list, admins can modify the mailbox settings of a user (if the admin owns permissions). The “general” box came with version 6.5 to enable admins to hide the user from address lists. 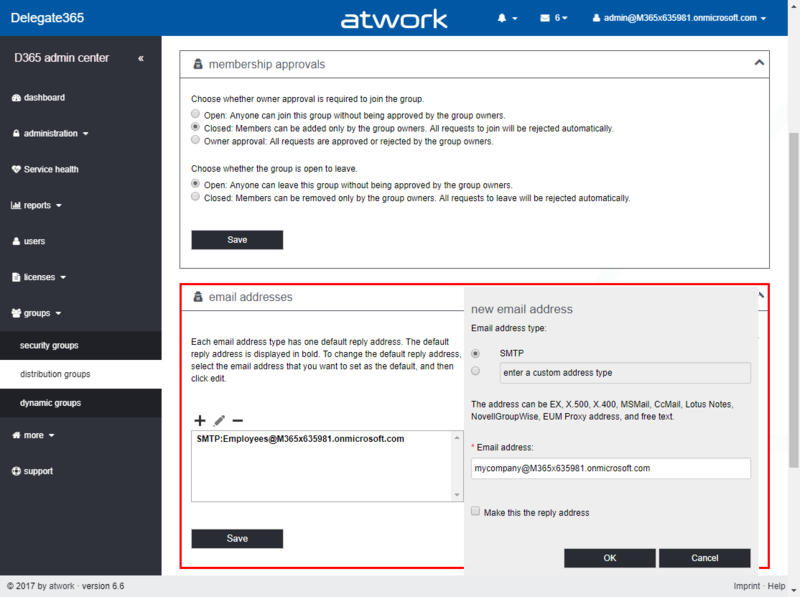 In here, admins can restrict the user’s access to specific features as enabling or disabling Outlook (on the web), using IMAP, POP3 or MAPI access, Litigation hold and Archiving. So, we do have much more settings to define the behavior of Exchange Online for a user’s mailbox. Below that, further mailbox features are available as before. Distribution group new features: There have been new settings added in the distribution groups. The new “email addresses” section allows to manage multiple email addresses for one distribution group as follows. When saving the new email alias is added to the group. Info: In this version, this works for mail enabled security groups and distribution groups only. With the next version, support for Office 365 groups will be available as well. Auditing history (reminder): We experienced, that the auditing log can become really large and that admins usually don’t need to go back for a long time frame when searching for operations. To reduce the storage and to fasten operations within Delegate365, the audit log now goes back for the last 7 days. Usually, going back a week is sufficient for a quick find of logs. Also, the Audit logging was changed from a single table to monthly tables. Both feature have already been introduced with Version 6.5 (pls. see Audit logging per day, Audit logging per month and Direct access to audit logs), just as a reminder. Due to technical reasons, search works with the "startswith" operation. So, if we search for "kelly" in this scenario above (the name property is "bob kelly (tailspin)"), the entry will not be found. If we search for "bob" or "seattle", the entry will be found (lower an uppercase is ignored, leading or ending spaces are trimmed). 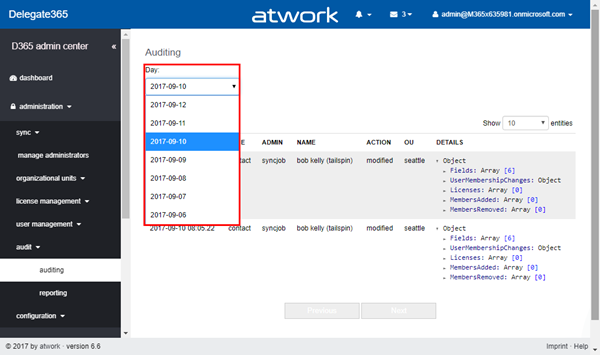 Therefor, we recommend using the auditing module in Delegate365 just for quick lookups. If you need more detailed search, we recommend using the "reporting" module where you can get direct access to all logging data and use tools as Microsoft Excel or Power-BI or similar. New Dashboard element Service health (reminder): If your tenant has not been on version 6.5 before, you need to re-run the Delegate365 setup once to enable the service health dashboard. Please look up Delegate365 changelog version 6.5-Service health, logging and more and how to Delegate365-(Re)run the setup. Fixes: The Sync operation was optimized again to reduce the runtime and some minor fixes have been made in the UI. 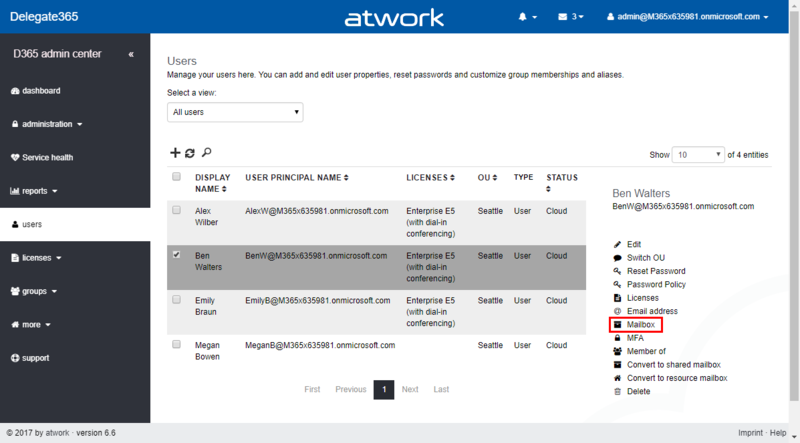 All existing productive Delegate365 tenants will be updated starting with mid of September. 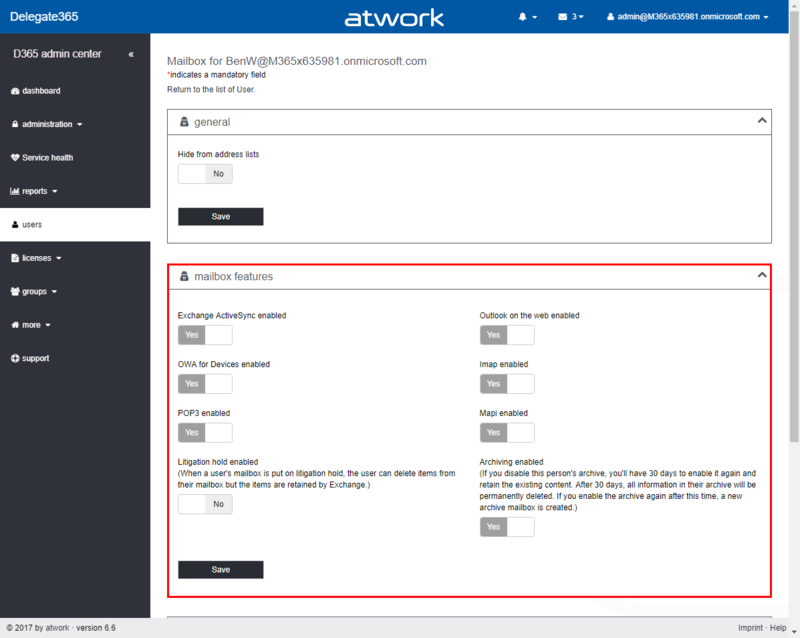 New Delegate365 trials will automatically be available in the latest version. We hope you enjoy the new features of Delegate365!